From Mad Max: Fury Road and Atomic Blonde to Tully, Charlize Theron’s characters find strength in endurance in a world dominated by men. Charlize Theron is an actor who forges these kinds of women; women who are both made by their scars and empowered by them — An approach that contrasts with so many modern archetypes of female strength. Woman can seek empowerment in perfection — in Wonder Woman for example — but there’s also room to embrace, as Theron does, the chinks in the female armour, the unhealed wounds. Though her profile blew up in the late 1990s and early 2000s thanks to the likes of The Devil’s Advocate, The Cider House Rules, and Sweet November, it was with Patty Jenkins’ Monster that Theron truly came into her own, winning an Oscar for her portrayal of serial killer Aileen Wuornos. The role represents an extreme — a woman whose pain both made and destroyed her — but it’s an emotional well Theron has dipped into many times as an actor. Her work is marked by raw, familiar portraits of womanhood; whether posed as the action star, or trading in punches for punchlines. 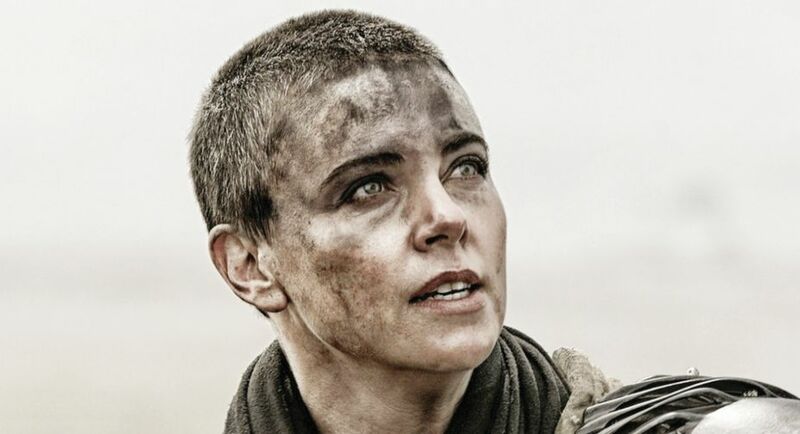 It was Theron, as Furiosa, who provided the emotional core in the relentless Mad Max: Fury Road. Within all that noise, Theron found her silence — Portraying a woman who has suffered deeply at the hands of the men around her; the men who, in her words, “killed the world”. But she is reawakened to hope in her rescue of the Immortan Joe’s wives; women who still have the ability to foresee a better world with “no unnecessary death”, as they cry out to prevent Max (Tom Hardy) from killing Nux (Nicholas Hoult). It’s evident in her absolute devotion to these women, as she shields them with her own body from incoming gunfire. But beyond that, Theron allows Furiosa to be inscrutable where needed — does she feel a sense of duty to them? A sense of guilt for the years she served their abuser, Immortan Joe, climbing the military ranks to the position of Imperator? Or does she see something familiar in them? A faded memory of her childhood amongst the Vuvalini of Many Mothers, the harmonious matriarchy she yearns to return to, living amongst the fertile land of the Green Place. There was joy there once. And Theron allows that old joy to flood back in one poignant moment, when she finally returns to the Vuvalini, with Immortan Joe’s wives in tow. Furiosa watches them raise their hands in a unified salute to her long-dead mother. In that small action, she’s reminded of when women were people, not things — of when life was free and hers to savour. She cracks her one, genuine smile of the entire film. Her most tender moment. Of course, her hope is ultimately betrayed and whatever snatched moment of happiness arises soon falls to pure anguish — the Green Place has been contaminated, and is no longer inhabitable. Director George Miller captures the shot in one take — Theron pulls down the barriers of her stoic hero and unleashes the pain with a single, primal cry. Atomic Blonde’s Lorraine Broughton is similarly wrought from cool steel. She’s a product of the world of espionage, its secrets clouded in the back alleys of Cold War Berlin. Yet, Theron knows when to puncture the illusion — to let surface vulnerability in, even if it’s simply for a fleeting glance. The film opens with Lorraine learning of the death of a lover, but she reacts only with the brief twitch of the eye. We never quite understand how much he meant to her, but there’s still a quiet shadow of grief that Theron lets hang over her performance, hinted at in the moments of pause behind the closed doors of her Berlin hotel room, a ramshackle mess of dirty dinner plates, discarded clothing. She still has nightmares about him. There’s a desperation, even, to how Lorraine fights. Stunt coordinator Sam Hargrave has emphasised Lorraine’s resourcefulness as a key to her choreography. She’s quick to grab any item from her environment that may prove a useful weapon — lamps, mixing desks, a length of hose — making her actions fuelled by an instinct for survival far removed from the clean, lithe moves of so many female action heroes. At the conclusion, when all the deals are done, her enemies dispatched, Theron finally lets Lorraine’s humanity surface for a single line, “I want my life back.” As she wipes the blood off her face and slowly removes her wig, the tears welling in her eyes allow for one moment of pure vulnerability for a character who, until now, could easily have been painted as the unstoppable badass. Theron’s use of vulnerability in her work becomes particularly fascinating when those approaches move away from traditional celluloid heroes, best exemplified in her work in Jason Reitman and Diablo Cody’s dark comedies Young Adult and Tully. Two films thematically interlinked — Young Adult examines a woman who feels at a loss without motherhood, Tully examines a woman who feels at a loss with it. As much as the idea of the mother goddess has its powerful roots in mythology, it leaves little room to acknowledge where motherhood may betray its uglier facets: the sweat, grime and sleeplessness. A celestial image of mother and child, bonded by love, isn’t a complete portrait. Where does the sight of Marlo fit in? The circles dark as a chasm under her eyes, her body flopped onto an armchair, a glazed expression on her face, as a TV show about male gigolos plays out to the room? In a way, it’s what both Marlo and Young Adult’s Mavis must grapple with; that their true natures don’t conform to what womanhood demands of them. Marlo isn’t the doting, angelic mother. Mavis likely didn’t even want children in the first place. But this is a failure in the world’s eyes. But as selfish, bitter, or defeated as these two characters may appear, Theron ensures they’re painted as warriors against their own mundanity. They may feel disillusioned, but they’re not about to give up anytime soon. She allows that conflict to flourish, but not to overwhelm; she creates a physicality to them that feels weighed down, exhausted by the world, but not yet broken. As an actor, she’s always created women of endurance.